Here is a travel tip on how to search on the internet for a plane ticket. Normally we just obey the box; we enter the departure location and our destination. To get the best prices we need to understand the airlines routes and pricing. 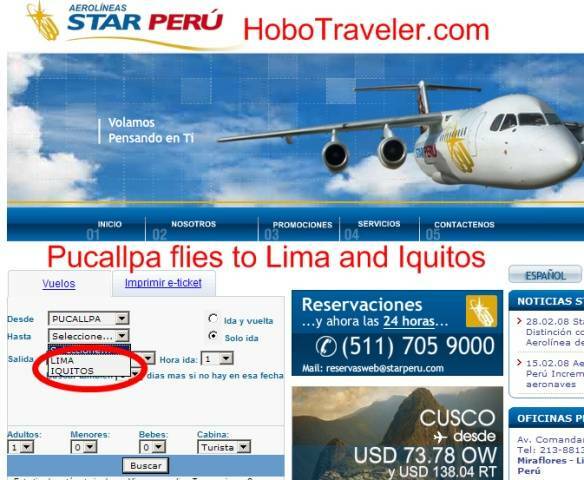 I just used StarPeru.com to fly from Lima, to Pucallpa, Peru for 83 US Dollars. The normal way to search is from Lima to Pucallpa. 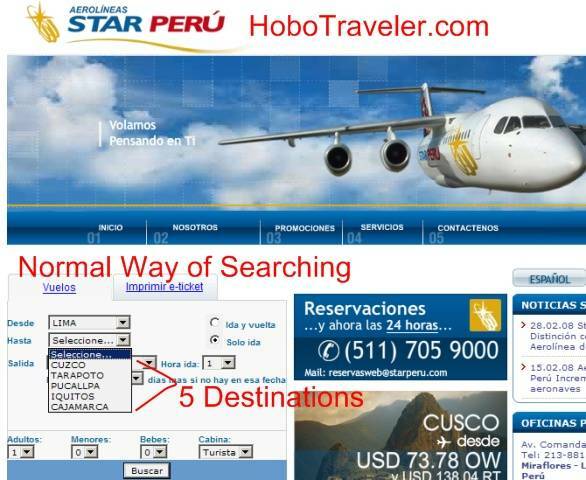 If you look at the graphic, you can see there are five locations that StarPeru.com flies to from Lima. Little airport to other airports. ---- These are two common routes for planes in and out of Pucallpa. When I search backward, I see that flights from Pucallpa only fly to Lima and Iquitos. Why does this information help? I now know the common routes into Pucallpa with StarPeru.com and normally most airlines. I was in Guatemala, I checked to see if I could fly cheaper to Iquitos than to Lima. I was trying to do a stopover in Iquitos on the way to Pucallpa. Guatemala - Lima - Pucallpa. By searching backwards I realized the regular paths of the airlines and it becomes possible to find the best paths and learn how the airlines think.